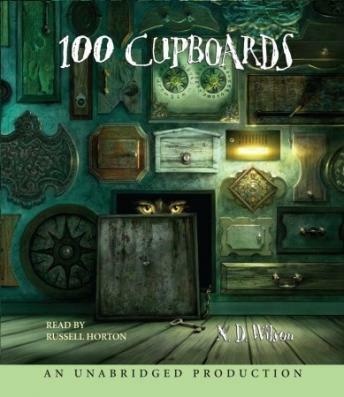 Discover the dangers locked behind the cupboard doors in the first book in the bestselling 100 Cupboard series, about 100 cupboard doors leading to 100 worlds of adventure! Henry isn’t brave, but when he hears a thumping and scratching on the other side of his bedroom wall, he can’t ignore it. He scrapes off the plaster and discovers mysterious doors—cupboards of all different sizes and shapes. Through one he sees a glowing room and a man strolling back and forth. Through another he sees only darkness and feels the cold sense that something isn’t right. When his cousin Henrietta boldly travels into the worlds beyond the cupboards, it’s up to Henry to follow her. Now that he’s opened the doors, can he keep the evil inside from coming through? Want to know where the cupboards came from? Don’t miss the latest book in the series, The Door Before! this was more interesting to the kids than I thought it would be. They were caught up in the adventure, and liked the story. Its not something they would re-read though. Those books (that they keep listening to over and over), get 5 stars. Excellent for all ages. Would recommend this for family listening.